Lea Hyvärinen's Curriculum Vitae with list of publications (PDF-file). Lea Hyvärinen's Curriculum Vitae in Chinese (PDF-file). You need Adobe Acrobat Reader to see PDF-files. Dr. Lea Hyvärinen is a Finnish ophthalmologist who after her doctoral dissertation on experimental fluorescein angiography in Finland, was invited to work (1967-1969) as Dr. A. Edward Maumenee's Fellow at the Wilmer Institute, Johns Hopkins Hospital in Baltimore, MD. Dr. Hyvärinen was given the opportunity to start the first clinical fluorescein angiographic laboratory which provided new insight in diabetic retinopathy, retinitis pigmentosa, and histoplasmosis. 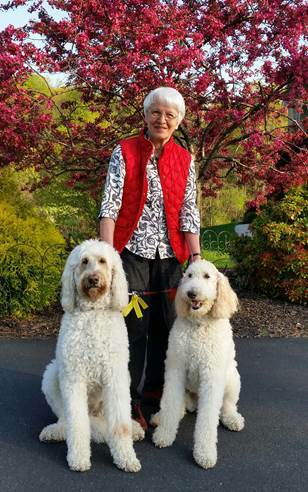 At the Wilmer Institute, she worked closely with Dr. Louise Sloan and her team in vision rehabilitation. These experiences strongly influenced Dr. Hyvärinen’s career in vision rehabilitation and further development of vision assessment techniques. Dr. Hyvärinen worked with her late husband’s Juhani Hyvärinen’s research group at the Institute of Physiology at University of Helsinki (1971-1983) on visual deprivation studies of monkeys. These investigations showed that early vision deprivation permanently changes function in the neural networks normally combining visual information with other sensory information and ongoing activities. As a result, vision loses its presentation in cortical functions. These studies helped form her theoretical foundation in early intervention. Dr. Hyvärinen is best known for the LH Vision Test System, now known as LEA TEST VISION SYSTEM™. She started the optotype development in 1976 with Dr. Veijo Virsu’s team at the Department of Psychology. 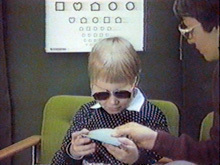 In 1977, the first LH tests were printed for testing at the Vision Rehabilitation Centre in Helsinki, Finland and published in 1979 for health care centres in Finland. 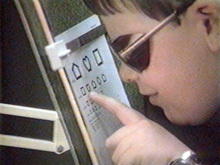 The LH Symbols tests (now referred to as LEA SYMBOLS® tests) are used for assessment of vision in children and became popular in 1980’s for vision screening. Dr. Hyvarinen’s first publication on the LH Symbols test was written in Finnish, 1979 and in English, 1980: Hyvärinen L, Näsänen R and Laurinen P. New visual acuity test for pre-school children (1980) Acta Ophthalmol (Copenh) 58:507-511. In Figure 1, the LH visual acuity tests are from a 1983 VHS film. The tightly crowded test in Figure 1.B. was the first test of its kind to improve diagnosis of increased crowding effect in reading difficulties before the child starts to read. The present variants of the LEA TEST VISION SYSTEM™ tests are located at the Instructions hyperlink. Figure 1.A. Children with very low visual acuity due to complete rod monochromacy were tested with regular full-contrast near vision test (100% spacing). B. Testing with the tightly crowded near vision test. C. Testing with grating acuity test held by the boy. Behind the boy on the wall is the small distance test for 3-4 year old children. D. Testing recognition of small objects on different contrasting and less contrasting surfaces. 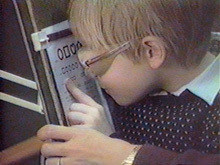 In 1983, these visual acuity tests were called LH-tests which name is still used in many European countries. Dr. Hyvärinen was a member of the task group that planned teaching at the Nordic Staff Training Centre for Deafblind Services (NUD) and lectured (1980-1987) in ophthalmology at the Centre. In 1984, she trained a rehabilitation team in Madrid and since then has given courses in more than 60 countries. She spent a sabbatical (1987-1988) at the Smith-Kettlewell Institute in San Francisco, CA where she wrote a book on communication based on her assessment of deafblind patients using an excellent interpreter. Then she worked at the Institute of Occupational Health (1988-1991) and created her LEA NUMBERS® in 1993 for visual acuity tests at full and low contrast levels for international collaborative studies. In 1992, Dr. Hyvärinen served as an advisor to the World Health Organization (WHO) in the task group of International Council for Education of the Visually Handicapped meeting in Bangkok, to write the recommendation “Management of low vision in children” and at the Geneva meeting in 2003 for the “Development of Standards for Characterization of Vision Loss and Visual Functioning.” She was also a WHO advisor (2003-2009) for the Eastern Mediterranean Region to develop vision rehabilitation. Since 2003, Dr. Hyvärinen serves as the Honorary Professor in Rehabilitation Science at the Technical University of Dortmund, Germany where she collaborates with Professor Renate Walthes’ group to develop assessment of functioning in children with learning problems, especially in reading. She served as a Senior Lecturer in Developmental Neuropsychology, University of Helsinki, Finland (2004-2010) lecturing on vision for education and development In 2011, she and her co-author Dr. Namita Jacob published a summary of their lectures as a book “WHAT and HOW Does This Child See?” Dr. Hyvärinen’s website www.lea-test.fi provides information on vision in several languages. She continues to lecture in many countries to help in the development of transdisciplinary assessment for early intervention and education. The LEA TEST VISION SYSTEM™ now contains 40+ core tests for numerous clinical assessment situations and vision screening of children and adults with different communication needs. Her optotypes are also used in more than 150 other tests. The majority of these tests are produced by Good-Lite® Company and distributed to 140+ countries. LEA SYMBOLS®, LEA NUMBERS®, HIDING HEIDI®, LEA GRATINGS®, LEA 3-D PUZZLE®, LEA FLICKER WAND®, LEA RECTANGLES GAME®, and LEA MAILBOX GAME® are the intellectual property of LEA Test Intl, LLC™. The company is located in central Pennsylvania and is responsible for all of Dr. Hyvärinen’s trademarks and copyrighted works. Since 2010, Dr. Hyvärinen is retired from medical practice, but she still lectures in international conferences and via the Internet. While preparing her lectures, she enjoys the company of her faithful assistants, Charlie and Sam.